Axel Douque at Ocean Independence sends me details of his latest new listing, the 45.72m motor yacht Sea Dweller. Built by Heesen in 1999, she had a complete exterior and interior refit last year, including the addition of zero speed stabilisers. 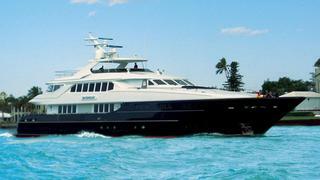 She can accommodate up to 12 guests in a master suite, two double cabins and two twin cabins. She has ample deck spaces for sunbathing, as well as a large swim platform and sundeck with louvered top, that can be adjusted for the perfect amount of sun shade. She can reach a maximum speed of 28 knots, cruises at 18 and has a range of 3,600NM at 12 knots. Currently lying in Sanremo, Sea Dweller is asking €12.5 million.